Compact cars, and cars in general for that matter are not flying out of showrooms and off lots as quickly as they were doing a few years ago when gas prices were considerably higher than they are right now, but they still sell in big numbers despite the popularity of bigger, less economical vehicles. What it means though is cars have to be very, very good to attract buyers at the moment, and when it comes to compacts there are few better than the 2017 Ford Focus and the 2017 Mazda3. There's little doubt both are better than they've ever been, so choosing between them could be quite difficult. To help you decide which is best when trying to decide between them, here's our 2017 Ford Focus vs. 2017 Mazda3 comparison to help you out. Both models are now in their third-generation, but the third-generation Focus has been with us a couple of years longer than the Mazda3. 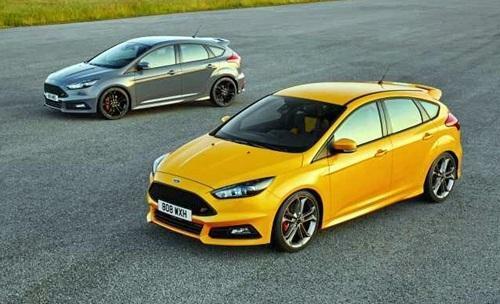 However, the current 2017 Ford Focus has undergone quite a lot of development since the third-generation went on sale in early 2011 so it certainly doesn't look in any way an older design than its Japanese rival. These are both seriously good-looking compacts and both are available now in sedan and hatch formats. The Mazda3 has a problem that the Ford doesn't have though, and that's the Mazda CX-3 crossover that's basically a taller, more modern and more attractive take on the Mazda3 that's even built on the same platform. It's hard to see too many buyers choosing the sedan or hatch over the crossover built on the same platform, especially as it has an almost identical interior to the car too. Even ignoring this issue for the Mazda, the Focus still has a sharper, more contemporary exterior styling that's hard to fault. The interior of the 2017 Mazda3 is nice and neat, well designed and practical, but it can be seen as a little bland and uninspiring, even after its recent refresh. Homogenous interior styling isn't an uncommon find in the compact car segment, but it's something the 2017 Ford Focus certainly can’t be accused of. The interior of the Ford is modern, stylish and sporty, and the word cockpit has rarely been a better description of the area of the cabin reserved for the driver than it is here. The dash and controls wrap around the driver like the cockpit of a fighter jet or a space ship from a science fiction movie, with everything easy to be seen and controlled. If you prefer ok and ordinary the Mazda3's interior is fine, but it's hard to imagine most buyers choosing it over the Ford. The Ford has an advantage over its rival right from the start as it offers three engine choices to the Mazda's two, and from there it just doesn't get any better for the Mazda3. The Mazda's standard engine is a 2.0-liter four-cylinder unit that produces 155 horsepower and 150 lb.-ft. of torque. The standard engine in the Focus is also a 2.0-liter four-cylinder, but this time it delivers as much as 160 horsepower and 146 lb.-ft. of torque. There's also a 1.0-liter, three-cylinder EcoBoost available with the Focus that has no equivalent in the Mazda3, so we'll move past this global award-winning powerplant to compare the most powerful engines these two have to offer instead. 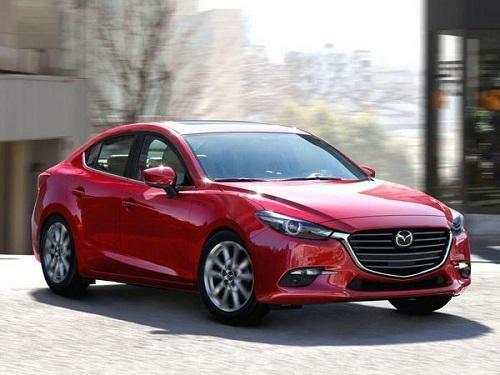 A 2.5-liter four-pot developing 184 horsepower and 185 lb.-ft. of torque is the most power the Mazda3 has to offer. That doesn’t really compare too favorably with the 2.0-liter EcoBoost turbo in the Focus that puts a frisky 252 horsepower and 270 lb.-ft. of torque at your disposal. And we're not even taking the awesome unit in the high performance Focus RS into consideration here as it's in very limited supply and not widely available enough for a fair fight here. Fuel-efficiency is still important to buyers of compact cars, so it's another feather in the cap of the Focus that it comes with better EPA-estimated ratings than the Mazda3. The best figures the Mazda can offer are 28 mpg in the city and 37 mpg on the highway, which is quite a way short of the 30 mpg in the city and 40 mpg on the highway of the 1.0-liter EcoBoost-equipped Focus. Mazda does make excellent vehicles, but most models suffer from being a little on the expensive side compared to many of their non-luxury rivals, and that's definitely the case here. The entry level model in the Mazda3 lineup costs around a thousand dollars more than the equivalent Focus, and the Focus is also better equipped. The difference is even greater at the other end of the Spectrum, with the top-specification Mazda3 Grand Touring costing over $2,000 more than the sensational Focus Titanium. Nobody would be unhappy owning and driving a 2017 Mazda3, but only as long as they don't then go and do a detailed comparison with the 2017 Ford Focus. The Ford has the Mazda beat in just about every way, which really is a compliment to the Focus as it's been around longer, it costs less, and the Mazda3 is a very good vehicle. It's just not as good, or as good value for money as the Ford Focus.